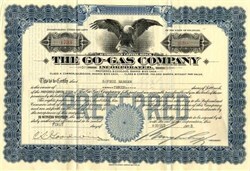 Beautifully engraved certificate from the Go-Gas Company issued in 1923. This historic document was printed by Franklin Lee Division - American Bank Note Company and has an ornate border around it with a vignette of an eagle. This item has the signatures of the Company's President and Secretary and is over 83 years old. We only have 3 certificates from this company, one green, blue and orange. 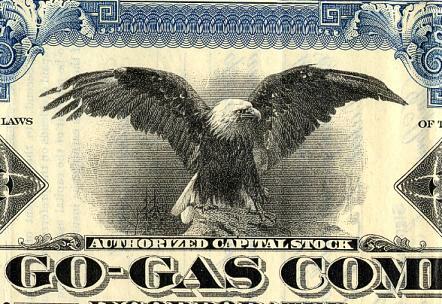 The company sold gasoline and motor oil on a retail and wholesale basis. 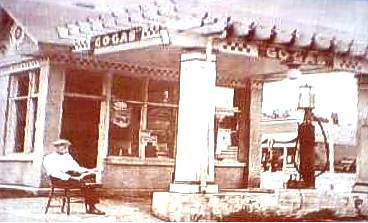 The company took over the assets of the Consumer Service Stations, they had 92 services stations, 52 wholesale plants, 3 district warehouses and 495 pumps.